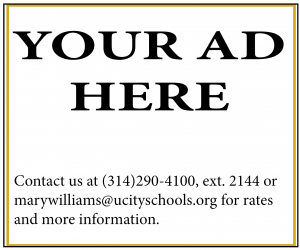 The U-Times staff is located in Room 346 at University City High School, 7401 Balson Ave, University City, MO 63130. Our email address is [email protected]. Tweet us or follow us on Instagram @utimesonline. Letters to the editor can be submitted to Mrs. Mary Williams in Room 346, or to any U-Times staff member, or to [email protected]. The U-Times reserves the right to reject, edit, or shorten letters. Our current web editor is Julian Albright. If you are interested in working on the website or joining the U-Times staff, contact Mrs. Williams.